We just got back from a weekend in Victoria, B.C., the capitol of British Columbia, Canada. It's located on Vancouver Island and is about 2 1/2 hours from Seattle via ferry (in our case the Victoria Clipper). We went to celebrate my wife's birthday and enjoy the decorations the city sports for the holidays. 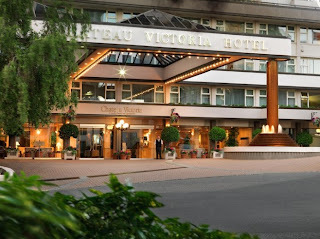 We stayed at the Chateau Victoria Hotel. The first day there, we went to the second floor to use the newly remodeled indoor pool. While walking through the hallway to the pool, we all distinctly heard the squawk of a parrot. There were some offices on the floor so I assumed the hotel kept a pet parrot and thought nothing about it. A few days later, we were in the lobby and I noticed a framed article on the walk about a Victorian mansion that had been torn down to make way for the Chateau Victoria Hotel. The mansion had been the home of an eccentric recluse named Victoria Jane Wilson. She grew up in the mansion and apparently rarely left it. Her only companions were a variety of birds including a parrot named Louis. When Victoria died, she left her estate to Louis with instructions that he was to live in the mansion until he died. The mansion became known as the Parrot House. Parrots, however, live a long time. Some life more than a hundred years. And Louis was one of them. But greedy developers eventually figured out a loophole to get Louis out of the house and he died in the late 70s at the home of the mansion's former gardener. 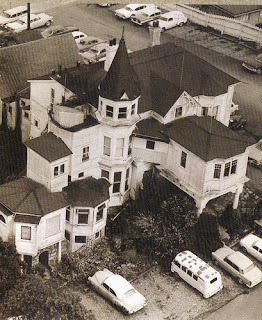 The mansion was torn down and the Chateau Victoria was built. And the rooftop restaurant was named the Parrot House at first, but was recently renamed View 18. The story made me think about the parrot we'd heard. So when we were in the hotel shuttle headed back to the Clipper terminal for our return trip home, I asked the driver if there was a parrot kept at the hotel. He shook his head and said no, but he suggested it might be a ghost and brought up the story of Louis. When I returned home, I did a Google search about the Parrot House and found a few articles recapping what I already known, but no stories of a ghost parrots. Though I did run across a few accounts of employees at the hotel thinking they encountered Victoria Jane Wilson. So who knows what we heard on the second floor of the Chateau Victoria Hotel. But the next time I stay there, I'm bringing crackers. Ahhh... this is just wonderful. Love the idea of a ghost parrot.